For convenience, assume that g-force ship's propulsion system consumes one million water molecules (H2O) during a given second of powered flight. If system is perfectly efficient, it would output all one million molecules, and the ratio of out/in would be one million : one million for E = 1.0 (or 100%). However, no process is perfectly efficient, and prudent practicality predicts propulsion system will be much less than 100% efficient. EXAMPLE: Of the one million molecules input to the propulsion, let 750,000 exit as exhaust particles which contribute to ship's g-force propulsion. Thus, E = 750,000 particles / 1,000,000 particles = .75 = 75%. The remaining 250,000 particles go elsewhere and makeup the inefficiency (E'). Inefficiency (E') is complement of Efficiency (1-E). Since output can never exceed input, both efficiency and inefficiency must have values between 0 and 100%. No human system will ever be perfectly efficient. For example, a typical automobile must divert part of it's energy output to peripheral equipment such as radio, air conditioning as well as essential components such the car's generator which provides essential electrical sparks to ignite the gasoline; thus, some output must divert as part of the auto's energy cycle. Like all planes, trains and ocean vessels, TE's g-force ship must divert part of it's output energy for non-propulsion requirements. For example, it has peripheral needs such as life support, communications, navigation. It will also have a primary component of the propulsion cycle which requires diversion of some of the accelerated high speed particles to super heat water particles into plasma ions for subsequent input into ship's particle accelerator, propulsion system. Without this feed, particle acceleration cycle cannot be sustained. The auto's combustion engine has continuously improved for over a hundred years, and the g-force spaceship's accelerator will similarly improve with continuously reduced inefficiency. For convenience, let's now arbitrarily assume systemic inefficiency (E') of 50%. Subsequent chapters will modify this assumption. 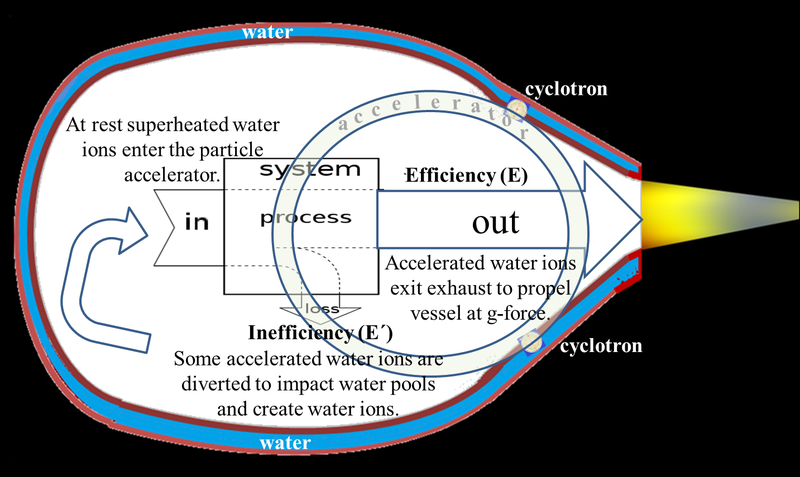 Above example shows us if a ship consumes one million water particles with 75% efficiency; that only 750,000 particles actually exit the ship and contribute to g-force propulsion. It might be useful to reconsider example. Q. If g-force propulsion requires 1 million particles to exit the ship each second of powered flight, how many particles must be consumed each second to accommodate both the propulsion and the requisite inefficiency??? A. To determine required consumption rate, TE uses an efficiency factor (ε), the reciprocal of E, efficiency. 1) ffsec , fuel flow per second, required for g-force propulsion. Can be determined from momentum conservation. 2) ffDay , fuel flow per day, required for g-force propulsion. Compute with factor 86,400 sec/day. 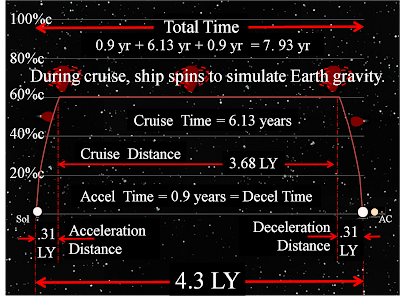 3)∇, daily percentage of ship's mass, which must exit ship's exhaust to produce g-force acceleration. In a perfectly efficient g-force vessel, ∇ = ffDay ; however, ffDay must exceed ∇ to provide auxiliary and peripheral power needs in addition to propulsion. 4) ε, efficiency factor, coefficient required to determine how much ffDay must exceed ∇. Find time (t in days) such that GWt = 50% TOGW. n, mass multiple, maps directly to particle exhaust speed, VExh. For example, for particle to grow in mass a multiple of 10 times, it must achieve a relativistic velocity of 99.5%c. TE assumes that technology will mass mult. (n) will increase as relevant technology improves. ∇, daily difference, is amount of ship's mass converted to ions and ejected from the ship's exhaust to propel ship forward at g-force. Arbitrary increase of 1% for every LY. Subsequent increase in VAcc will decrease cruise time. Our thought experiment notionalizes a spaceship with an particle accelerator propulsion system which constantly accelerates the vessel at g-force. Such a spacecraft could get us to nearby planets within days AND also simulate near Earth gravity throughout the trip. However, this same g-force propulsion system would take years to travel to the nearest star, Alpha Centauri (AC). Sol's nearest neighbor is a cluster of three stars about 4.3 light years (LYs) away. Further recall that g-force acceleration requires following flight profile. Reverse direction of spacecraft so that exhaust propellant particles now point to destination. Decelerate remaining half of journey to destination. Having renormalized velocity, spacecraft and crew can conduct planned operations. 1. Accelerating to Midpoint. Interplanetary distances are just a few AUs; thus, g-force acceleration will take just a few days. 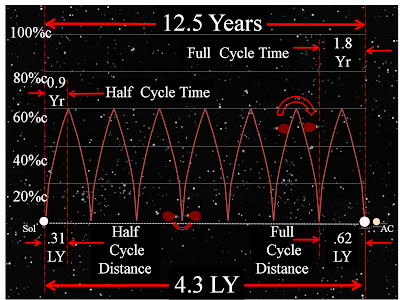 However, midpoint to the nearest star, AC, is over 2 LYs which is over 120,000 AUs; this takes years. 2. Velocity at Midpoint approaches c, light speed. Numerous published works in both theory and experiment continue to confirm that nothing can travel at a speed greater then c; but continuing to accelerate can take you closer and closer. Thus, relativistic effects can become quite pronounced. 3. 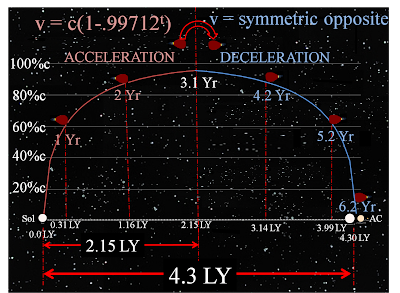 Theoretical Best Time would be acheived at light speed, c. Of course, we know spacecraft's final velocity, Vfin can ever approach but never achieve 100% c; thus, we can use c as an intuitive upper limit, which means 4.3 years with no time for accel/decel. Even this theoretical best time is a long time to accelerate a constant flow of ions out of our spacecraft. Can this be done? This is discussed further in next chapter, Practical Range. This chapter, Practical Profile, discusses several trip profiles which might prove practical for interstellar flight?? Near Earth gravity produces observed free fall acceleration of 9.80665 m/sec/sec. Following conversions translate same value into different units of measurement. We must transition from the convenient values used in first volume, because the much longer interstellar voyages cannot afford to give away value gained through more precise values. to more precise values in this Vol II, Interstellar. Transition from Newton's Formulas to Einstein's. Newton formulas work well for the special case of extremely slow motion which is the portion of the speed spectrum where we live our lives. Thus, Newton formulas are "good enough" for the interplanetary portion of our thought experiment because our accelerating spacecraft needs only days to reach nearby planets and thus never achieves enough speed compared to light speed. However, we need the more general Einsteinian formulas for instellar travel. Key example: While traveling to Mars, our g-force spacecraft might accelerate for two days before starting the deceleration phase. 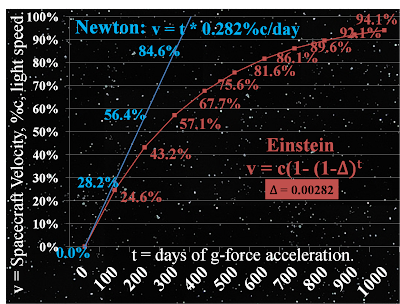 After one day of g-force acceleration, spacecraft has achieved .282% c; Newton's formula, acceleration times time, would give us two days times acceleration or 2 days times 0.282%c/day or .564%c, barely one half of one percent c, still a relatively slow speed even tho much greater then our current experential base. On the other hand, flights to midway from Sol to AC would take at least two years; Newton's formula ( g * t) would give us 731 days * .282%c/day = 206% c, twice the speed of light. Of course, this is impossible. However, this volume considers interstellar travel. Our particle accelerator, propulsion system spacecraft will take years to perform this travel; this is sufficient time for constant g-force acceleration to achieve significant fractions of light speed. Thus, this volume must use more general formulas. These are discussed in following tables. Recall again Einstein's Special Relativity axiom that all observers should measure same value for c regardless of observer's velocity. Thus, our thought experiment might expand to include a series of observers who are able to accelerate for a certain time then maintain the attained velocity indefinitely. Therefore, observer A might remain static at the starting point; but all other observers accelerate at g-force. Observer B might accelerate at g-force for one day, then maintains constant velocity while observers C through Z continue accelerating. Observer C would stop accelerating after for two days, then stop, and so on. Eventually, we have a series of observers separated by one day's g-force acceleration from the previous one and the subsequent one. After all observers have stopped accelerating, relative velocities between them becomes static. All observers (A through Z) would consistently measure light speed, c, as 299,792,458 meters per second at all times. However, they would measure each other's speed differently. Thought experiment conjectures that Observer A would measure B's velocity as .282%c after the end of first day. However, B continues to observe light speed as 299,792,458 meters per second, and thought experiment further proposes that B will measure Observer C's velocity as .282%c after end of second day. What value does A measure for Observer C's velocity after end of day two?? To answer that question, define a term, R, as remainder of light speed, c, not yet attained by a specified observer. For example, A would observe B's remainder, R, to be c (1 - .00282) for B after first day of g-force acceleration. Of course, B would observe same R = c (.99718) for C after second day of g-force acceleration. Recall Observer C accelerates for 2 days, then constant velocity. "i" indicates number of days traveled at g-force acceleration. Conclusion two part interplanetary profile won't work for interstellar. 1st, TECHNOLOGY. We have yet to design, build and operate a spaceship with a particle accelerator as the propulsion system; thus, the most compelling limit will be the transition from notional to actual. Of the numerous design tasks, an extremely difficult one will involves enormous energy to bring exhaust particles to near light speeds. Once solved, the increased mass and speed of the exhaust fuel flow (ffExh) will product an enormous momentum to propel the spaceship at g-force acceleration throughout powered flight. Throughout these volumes, several tables show that the higher the particle exhaust speed, the lower the quantity of original fuel mass (fuel flow per sec, ffsec) needed to propel the ship at g-force. This means that less fuel needs to exit the spaceship for same distance traveled. HOWEVER, this increased momentum comes at a cost; much more energy is required by spaceship to accelerate the particles to these near light speeds. %TOGW Limit is ½ ship’s mass. Percentage of ship’s TakeOff Gross Weight (TOGW is also known as initial ship’s mass) must be used for fuel with the rest needed for infrastructure and payload. Thot exp assumes 50%, but it could range from 10% to 90%. Return flight mandates a reserve. Cautious planning leads us to assume no refueling at destination or anywhere else along the flight path. Thought experiment assumes another 50% reduction to plan for return flight. Efficiency factor needs a margin. It's safe to assume that our initial flight design will not be perfect. Even if it was, we still have to consider energy needs for life support, and many other auxilliary energy requirements. Above factors lead us to determe total propulsion time (tp) from effectively converting 1/8th of the ship’s TOGW to kinetic energy. A further range limitation comes from the flight profile required to maintain g-force throughout the voyage. Flight Profile. Accelerate for ½ tp. Another range limitation comes from thot exp’s self imposed flight profile where the ship accelerates to half distance, then decelerates for remaining half. We’ve chosen this profile as best way to maintain g-force throughout the trip. We could possibly improve the range by accelerating perhaps 90% of the distance then decelerating at a much greater force for remaining 10% of distance. However, this much greater force would greatly exceed Earth like gravity and thot exp assumes this to be undesireable. 3rd. STELLAR DISTANCES. Our finite range seems to keep getting whacked by above considerations; however, the near light speed of exhaust particles impact so much specific impulse that interplanetary space travel is easily accomplished with considerable margin. Consider above interplanetary table, the most demanding range (Kuiper Belt) is easily covered by the least capable row in the interstellar table (where n= 2). On the other hand, margin is definitely not there for interstellar travel. Consider the most generous table in the interstellar table (exhaust particle traveling so fast that relativistic effects grow it 11 times mass of same particles at relative rest with the spacecraft). Conservatively, resulting momentum gives spacecraft a range of 329 days of acceleration to take us to 1/3 of one LY; another 329 days of deceleration would take us to .64 LY, the entire distinace is not even close to the Oort Cloud, edge of our Solar System. Thus far, our notional spacecraft hasn't made any significant progress toward our nearest stellar neighber; yet, our notional spacecraft has already exhausted available fuel. Thus, we must now use reserve fuel to return back to departure point, while still far short of our goal. 4th. RELATIVISTIC PARADOX. Consider an extreme scenario from one of Robert Heinlein's novels, which elaborates on the "twin paradox". Two identical twins grow up together then separate, where one twin accelerates to near light speed, then travels on an interstellar journey for a few years. The traveling twin ages a few years and eventually returns to Earth as still a young man. Upon his return, he's amazed to discover that his meager savings has made him very wealthy and his twin has become an old man; so old, that he marries his twin's great-granddaughter. This fanciful story illustrates that relativistic effects could become very pronounced; thus, this thought experiment assumes that near light speed travel will be accomplished in a carefully controlled manner. 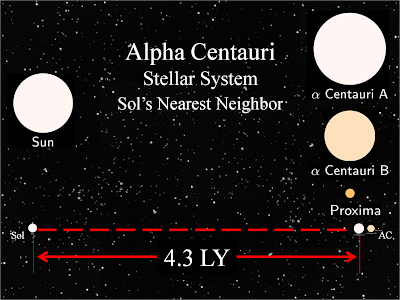 For example, initial trips to Alpha Centauri might attain a cruise velocity of perhaps .5c, observing results, then incrementing subsequent trip's cruise speed to perhaps .51c, and so on. Click on image for enhanced view. After 2 days of powered flight, spaceship achieves an enormous velocity (1,694.6 km/sec, much greater then Earth's escape velocity, 11 km/sec), and the spaceship needs the remaining two days for g-force deceleration to slow back down to essentially zero velocity. For initial flights from Earth to other planets, flight planners must assume that spacecraft needs entire fuel load for all four phases. Perhaps after humans have gained considerable spaceflight experience, we might learn to gather fuel from other places in the Solar System. Til then, we'll have to assume the only fuel available is what we start off with. Seesaw velocity curve vs. flattop velocity curve. Problem: maintain near Earth gravity conditions for entire interstellar voyage. Thus, trip will be a series of accel-decel cycles. Note: size increase and time dilation effects make this choice particularly interesting. Above profile might get us to Oort Cloud, it won't get us to even the nearest stellar system (happens to be Alpha Centauri, AC). Building upon above model, three possibilities come to mind. We must adjust our thought experiment. Additive method clearly does not work because after 350 days of g-force acceleration, it shows final velocity exceeding light speed, an Einsteinian impossibility. Thus, we hypothesize another method based on following two assumptions which relate spacecraft velocity to c to the observer’s position and velocity. First assumption, onboard observers always see light speed, c, as 300,000 km/sec faster (then their current spacecraft speed). · On board propulsive force still accelerates them; thus, they still feel g-force to simulate near Earth gravity. · Distance to destination continues to decrease. · · ship’s mass increases. These changes also affect the ship bound observers; thus, they don’t notice them. Second assumption, Earth bound observers closely monitor the spacecraft as it proceeds toward its stellar destination. They also see c as 300,000 km/sec faster (in relation to their position/speed). · They see spacecraft distance increase in a non linear fashion. · They eventually determine the daily increase in spacecraft velocity to be 0.288% of the difference between c and spacecraft's speed for previous day. Recall from Vol. 1, that most interplanetary flights require less than 10 days for g-force acceleration. Thus, interplanetary flight profiles all consisted of accelerating to midway, then deceleration to destination. PEAK PATTERN. Extend interplanetary pattern to interstellar. Accelerate to midpoint, then decelerate to dest. Earthbound observer would measure following times for g-force spacecraft. 1 year. Spacecraft .38 LY dist . traveled, .64c velocity. 2 yeas. 1.15 LY, 87% c.
3.1 years, reached midway from Sol to AC, 2.15 LY, .95c. Ship rotates 180° so that exhaust particles reverse direction and point toward AC, destination. Maintaining symmetry. 1.1 years from midpoint or 4.2 years into voyage, 3.15 LY, 87% c.
5.2 years slowed back down to 64%c, and total traveled dist = 3.92 LY. 6.2 years, voyage ends for total distance of 4.3 LY and slowed down to very close to zero velocity. Problems with technology and relativity. Relativistic effects on ship and contents (which includes lots of crew and pax) is unknown and should be approached cautiously. Scale. Finally, the diagram displays best possible case of interstellar travel because it's to the nearest stellar neighbor. Other stellar destinations would require even greater scale. SAWTOOTH PATTERN. Another profile might be a “sawtooth” repetition. Create a cycle of acceleration/deceleration and til arrival at destination star. This maintains g-force throughout flight and still significantly reduces travel time compared with vehicles traveling a much slower, constant velocity (recall examples: Voyager and Pioneer spacecraft). For example, let's arbitrarily pick 325 days as the number of days to accelerate then observe the results. NOTE: For convenience, chose arbitrary time/distance such that cycles from Sol to AC would be an integer number. NOTE: While thought experiment presumes impracticality of this profile, one can conjure of up scenarios where spacecraft might need to decelerate in midst of trip. For example, "Snowballs from Oort" describes method where midflight refueling could happen. Accelerate at g; constant velocity travel, c; decelerate at g.
Corresponding distances:.516 LY. ; 2.97 LY ; .516 LY. Corresponding travel times:1.0 year; 3.0 year; 1.0 year. Total travel time = 5.0 years. FLATTOP PATTERN. Accelerate, cruise, decelerate. In our thought experiment, a spaceship accelerates at g-force to simulate gravity and attain enormous speeds. Since our spaceship will eventually orbit some destination, it must slow down at the same g-force for the same amount of time. Thus, our spaceship is constrained to accelerate to midpoint of voyage, then decelerate for remaining half of the flight.Given above scenario, thought experiment defines key concepts, Δ, and R.Δ - Daily difference in spaceship's velocity is due to acceleration caused by constant g-force. We approximate this percentage value by using our more precise values to close approximate speed attained after just one day of g-force acceleration. Velocities attained after subsequent days are determined as shown below (to be added later)R – Remainder of c not yet attained. We now know that a massless photon travels at velocity, c; but our g-force spacecraft can never attain that velocity regardless of how many days accelerated. Unfortunately, Newtonian physics presents a paradox. As previously described, Newton’s laws of motion has a g-force spaceship accelerating at about .489 AU/day2 (= g = 9.80665 m/sec2). Since light speed, c, equals 173.15 AU/day, Newtonian physics has our notional spaceship traveling at light speed in 355.5 days (=c/g) which we now know is impossible. Thereafter, Newtonian physics has ship exceeding c, which is even more impossible. Clearly, we need another way to describe our spaceship’s motion. Perhaps Calculus will show us a way. 1. No one is observed at or over c, light speed. 2. All observers consistently measure photons at the same velocity, 173.15 AU/day. Consider two observers: one is on the notional spacecraft, and the other observer stayed behind at the ground support system on planet, Earth. After one day of g-force travel, Earth bound observer (OE) measures spacecraft’s velocity at 0.2826% (= .489 AU/day / 173.145 AU/day) of light speed. The one day observer (O1) observes Earth receding at .002826c, but he continues to measure c as 173.15 AU/day; this is the same value for c as determined by OE. Therefore, we determine that after first day of constant g-force acceleration, Earth bound observer will measure our spacecraft to have attained approximately 0.2823% of light speed. Thus, we now need to determine likely measurements for succeeding days. Thought experiments are wonderful things! Not only are they extremely low cost models, but they’re not constrained by life support considerations. For example, Einstein’s famous thought experiment was about the accelerating elevator accelerating through deep space, and it didn’t need to carry an array of equipment for the occupant, not even food or air. Similarly, our thought experiment is going to discharge observer, O1, after exactly one of g-force acceleration when O1 will maintain velocity attained by spaceship after exactly one day. In like manner, spaceship will accelerate for a second day and discharge O2 to maintain greater velocity achieved after two days of g-force acceleration. 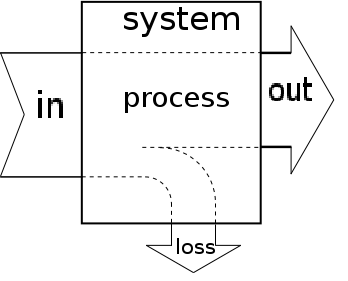 After these two days, consider objects as shown in following diagram. G-force spaceship ever increases speed at acceleration, g.
O1 is discharged exactly at end of day one and serves as permanent marker of spaceship's velocity at that time. Similarly, O2 is discharged exactly at end of day two to show spaceship's velocity at that time. Einstein says that all observers observe light speed as c, regardless of observers' respective velocities. Both OE and O1 initially observe a relative ship's initial velocity as zero. OE certainly observed ship beginning of flight, start of day one when relative velocity was zero. He then observed ship accelerate at g for rest of the day. O1 was discharged by ship at start of day one. For an instance upon discharge, he shared ship's velocity; thus, he initially observed ship at relative velocity, zero, exactly at start of day two, when he began his observation. Thereafter, he observed ship accelerating at g.
O2 was discharged by ship at start of day two. Being at constant velocities, O1 and O2 both serve as permanent markers of g-force spaceship velocities achieved after days one and two respectively. Given above conditions, OE and O1 have to measure same velocity increase for their respective successors. On the other hand, OE observes ever increasing velocity for the g-force spaceship; thus, he must measure different velocities for O1 and O2. Thus, OE and O1 must observe different values for O2. What does OE observe as O2, the ship's second daily velocity? To help OE predict g-force spaceship's velocities for succeeding days; let's define terms: delta and remainder. nominal acceleration due to gravity at the Earth's surface at sea level. After one second of g-force acceleration, the starship attains a velocity of 9.80665 m/sec. light speed in a vacuum. % light speed after first second of g-force acceleration. Exponentials help determine corresponding values for first minute, first hour and first day of g-force acceleration. For this chapter's thought experiment, our notional starship daily discharges observers to monitor starship's speed. Thus far, our thought experiment concludes that all observers consistently measure same relative value for starship’s initial daily increase. We've previously defined this amount as Δ, the daily difference. What if our starship picked different duration to discharge observers: hourly, every min, every sec? Everyday, a string of 86,400 observers would each measure the starship's speed for every second throughout the entire day. If every single observer observed exactly same relative value to its successor, this value would prove to be remarkably consistent, and it would certainly be a more precise value then then the Daily Diff, Δ, mentioned above. This presents a quandary. First: if first day of g-force acceleration brings the spacecraft to .282% light speed, does 2nd day double it to .564% c?? 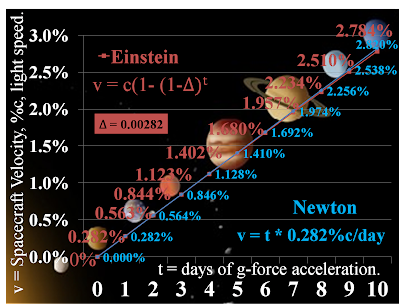 Second: if so, can we continue to add/multiply days of g-force acceleration times 0.282%? Of course, we immediately realize the answer to second question must be "No"; otherwise, in about 355 days, this method exceeds light speed, an Einsteinian impossibility. Thus, we eventually realize the answer to first question must also be "No". The model which describes g-force velocity must apply universally. It cannot apply to g-force spacecraft for 354 days then stop applying on day 355. It must apply for all durations; even for small durations such as two days and less. Thus, 2nd day velocity cannot double first day's velocity. Perhaps we can further leverage the Delta Concept to resolve this quandary. 3 Days of g-force TravelPart I. All Observers Measure Same c.
3 Days of g-force TravelPart II. O2 <==O3observes O2's speed as -Δ. Previous Observers at velocity decrease, -Δ. 3 Days of g-force TravelPart III. Successive Observers observe same velocity increase, +Δ. 3 Days of g-force TravelPart IV. Earthbound Observer Measures Different Velocities for Different Observers. Which brings to the current question: If we use Newton's Laws to estimate initial day's velocity due to g-force acceleration, how can we more accurately estimate 2nd day's velocity, 3rd day, succeeding days?? Successive Observers observe same velocity increase, 0.49 AU/day. Above table clearly indicates that if we assume same value for each observer's relative velocity for initial daily velocity increase; then, it follows that each observer would also observe same value for relative velocity of initial daily remainder of light speed. We make the intuitive leap (i.e. assumption) that OE will interpret succeeding R values as shown below. It follows that Rt = Rt = c (1 - Δ)t . For example, we can readily compute the remainder for the 100th day of g-force acceleration: R100 = (1 - Δ)100 which is readily available from any calculator with the x^y function. Recall that we assume a consistent Δ which always equals 0.2826% of previous day's attained velocity. Of course, velocity is easily computed from any remainder value by subtracting it from 100%. Earthbound Observer measures monotonic increase of ship's velocity.